GridinSoft Anti-Malware is the modern powerful solution that keeps rendering assistance to thousands of our customers to remove malicious software. It does its job quickly and effectively. Check PC for malware & get rid of it with ease. GridinSoft Anti-Malware is the best remediation against all types of computer threats on your Windows PC including malware, adware, and PUPs. It is quick, reliable and efficient. It’s your primary helper when you’re tired to struggle with unknown processes on your PC. Is not an antivirus, but much better and more effective! Defeat viruses within a few clicks instead of long-lasting and really boring manual procedures and get the help of security experts whenever you need it. Wherever you are, we are always ready to help you with your PC troubles. The download link for GridinSoft Anti-Malware is provided to you above. The download is an exclusive SharewareOnSale installer with registration built-in. Download and install GridinSoft Anti-Malware. 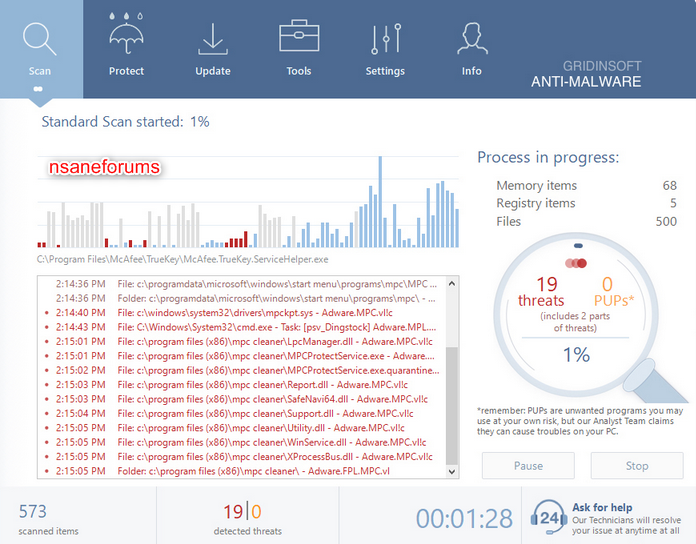 After install, run GridinSoft Anti-Malware and enjoy! There is no need to register it, because we register it for you automatically when you download from us.